Describe this Piece: I made this piece for an exhibition about the Scottish coastline for which I produced several series of paintings. I named the series from which this piece comes “Flotsam & Jetsam” because it focused on found objects that had been washed up on the shore. I loosely painted in the shell then applied a heavy gesso (to retain the brush strokes) in the surrounding background. Multiple coats of acrylic washes were then used over the gesso, rubbing each coat down with wire wool before applying the next. Finally I worked into the shell with thick bodied acrylics. The end result, unfortunately somewhat lost in the photography, was that the shell took on a three-dimensional appearance and the background had a deep satin lustre . I enjoy using various styles, subjects and media for my paintings, but I invariably return to detailed studies of elements within an environment. My preference has always been to use acrylic paints for such work but I also like to experiment with mixed media, including digital. Pete, this is VERY good. I would love to see more of your work. 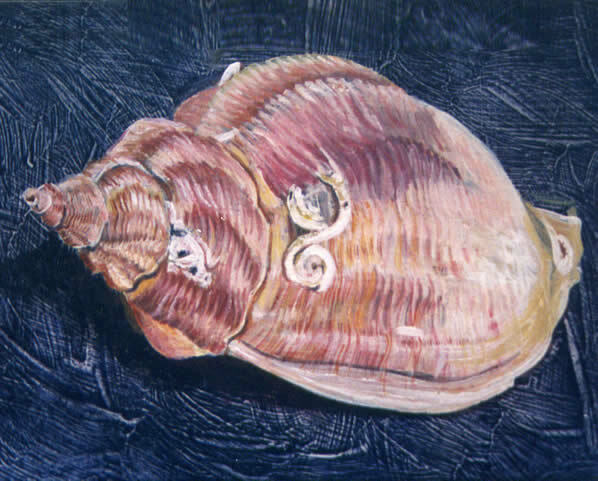 hello Pete,i am just staring out with acrylic.i like your work the shell has got a lovely luster and the background fits in well. Very good dad, but the photo doesn’t reflect the true quality of the actual painting.